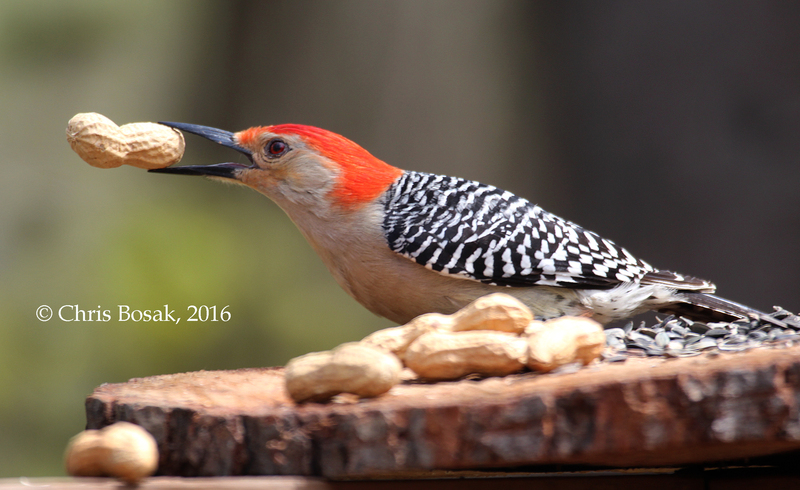 A Red-bellied Woodpecker takes a peanut from a homemade birdfeeder in Danbury, Conn., spring 2016. I wrote a few weeks ago about Blue Jays and how they love whole peanuts. They literally wait on nearby branches waiting for me to put some down on the platform feeder. Now the Blue Jays have competition. 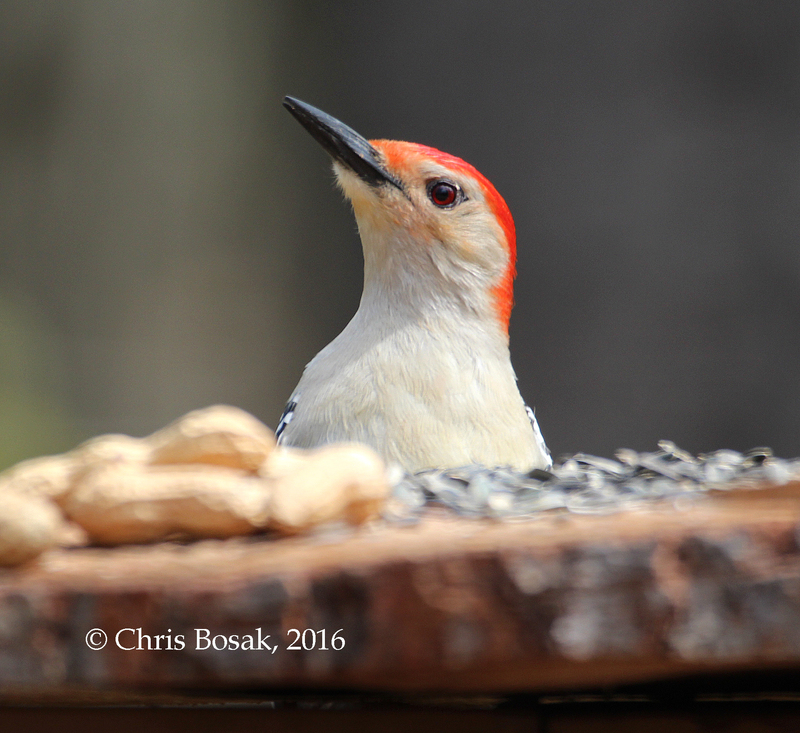 A male Red-bellied Woodpecker discovered the peanut station and visits daily to take as many peanuts as I’ll put out there. Here’s a few more photos of the Red-bellied Woodpecker. A Red-bellied Woodpecker perches near a homemade birdfeeder in Danbury, Conn., spring 2016. Click here to see the post on Blue Jays. 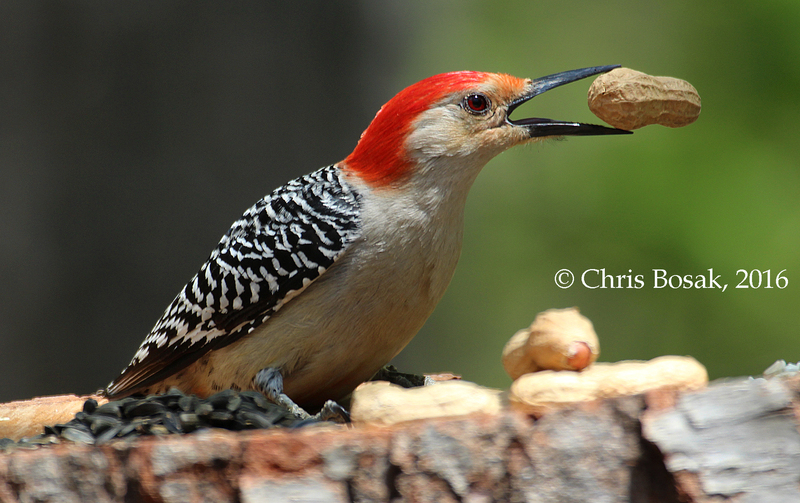 This entry was posted in backyard birding, bird feeding, Merganser Lake, Woodpeckers and tagged Chris Bosak bird photographer, red-bellied woodpecker, red-bellied woodpecker eating peanuts by Chris Bosak. Bookmark the permalink. Hey Chris how are you? We also have one Red Bellied Woodpecker that has been around for years!!! He also loves peanuts and when we throw them in the yard he dives down for one. He also loves the feeders with yummy seeds and nuts. We have a huge ladder leaning up against our garage in the back yard and our woodpecker will peck at it and wake the whole neiborhood up!!! This lets us know he’s hungry. It’s hysterical!!! Anyways we love all our beautiful birds and enjoy feeding & watching them. Thanks for all the awesome stories and pictures. Have a great Memorial Day. Thanks for the nice words, Scott and Lori. The birds are characters, for sure. Thanks again for writing and sharing your story about the woodpeckers. I have been feeding the beautiful jays peanuts all summer and only now did I see a red-bellied woodpecker grab one! This will make the 4th type of woodpecker to come by my feeder. Downy, Hairy, Flicker and now Red Bellied. Add this to the Piliated and Red-Headed I saw in Fair Haven Beach State park this spring, making this my lifetime record for most diverse woodpecker sightings in one season! Thanks for the response. Great year for woodpeckers! !